Which Intel® RealSense™ device is right for me? Whether you’re brand new to depth and tracking hardware, or an experienced professional, it can still be challenging to determine which of the many Intel RealSense Products we have available are right for your project. In this post, we’re going to discuss the Intel RealSense depth cameras D415, D435 and D435i, as well as the Intel RealSense tracking camera T265. Firstly, what is depth good for? What does tracking mean? Depth cameras are cameras which can see not only the 2D details of a scene, but can calculate how far away from the camera every pixel is. Stereoscopic cameras like the D400 series take two images from the two sensors on the camera, which have slightly different points of view, and compare them. The shift between the same points in both images can be used to determine depth. When you have these depth images, you can use them for many different purposes. 3D scanning is a popular application, along with skeletal and gesture tracking, measurement, volumetric capture, VR and AR, as well as many uses in robotics and drones. When we talk about our tracking camera on the other hand, we are talking about a camera that can track its own position. While depth cameras can be used to track objects and people in front of the camera, tracking cameras are used to track anything they are attached to with a high degree of precision, for example an augmented reality headset, an autonomous drone, or autonomous robot. Starting with the depth cameras, let’s look at what’s the same between models. Physically, the three depth cameras are about the same size (within millimeters). They all use the same vision processor to provide RGB-D data over USB 3, and they have the same maximum depth resolution of 1280 x 720. See the entire comparison chart at the end of the post for specific measurements. There are two main differences between these two models—field of view (FOV) and shutter type. The D435i is identical to the D435 in every respect, with the addition of an inertial measurement unit or IMU, so for all other features, you can assume it is the same as the D435. The Intel RealSense depth camera D415 has an approximately 65ۜ° field of view (FOV). The Intel RealSense D435 depth camera has a wider FOV at approximately 85°. What does this mean in terms of the camera’s performance? Because the FOV is larger for the Intel RealSense D435 depth camera, you’ll notice less granularity when looking at a specific portion of the image. Looking at the same size area on the pictures, notice the Intel RealSense D415 has a higher pixel density, which means it’s more accurate for any given area than the Intel RealSense D435 at the same points. At the same resolution, the D415 has more pixels per-degree, since it has the same number of pixels in a narrower field of view. While this may not matter in some cases, such as object avoidance or people detection, when accuracy is the number one consideration, for example in 3D scanning, the D415 will provide a better, more accurate scan. In short, the D415 is more than twice as accurate as the D435. Second, the Intel RealSense D415 depth camera has a rolling shutter while the Intel RealSense D435 depth camera has a global shutter. Cameras with a rolling shutter record all the pixels in a scene by rapidly scanning either left and right or vertically. This will usually happen over the course of a couple of frames, but the data will be saved as a single frame. Simple rolling shutter animation – each square is a pixel, yellow indicates that pixel has been captured. Global shutter cameras operate differently in that they snapshot the whole scene in a single frame, so every pixel is captured simultaneously. Simple animation showing how pixels are captured by global shutter sensors. In practice, because rolling shutter cameras capture an image in sections slightly divided by time, it can lead to odd image artifacts when something in the scene is moving rapidly – for example. In the image below, the propeller blades are distorted because by the time the imaging sensor has reached a different part of the image, the propeller has moved slightly. 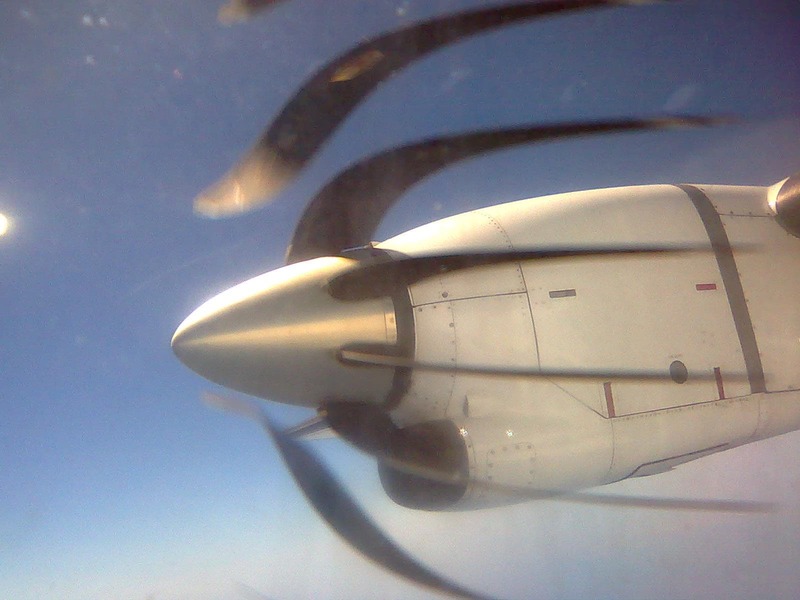 Image showing rolling shutter distortion of propeller blades – Source: Wikimedia Commons. The wider FOV of the Intel RealSense D435 depth camera makes it better for use cases like robotics and drone navigation. The larger FOV results in more time to react to obstacles, plus the global shutter provides better performance if you’re capturing high-speed motion by preventing blurring of the depth image. Another difference between the two depth cameras is that the Intel RealSense D415 depth camera is based on the Intel RealSense D415 module. This means the imagers, emitters, and RGB are on one compute board, or stiffener, making calibration much easier. The Intel RealSense D435 camera is based on the Intel RealSense D430 module with an attached, but separate, RGB camera. The depth algorithm is based on precise placements of sensors, so not having them fixed on the same stiffener may make calibration between depth and RGB problematic. However, users of previous-generation cameras said they really wanted the flexibility to choose their own RGB sensors, and so the D435 was born, and while it is more challenging to precisely calibrate color and depth data together using this camera, it is still possible. 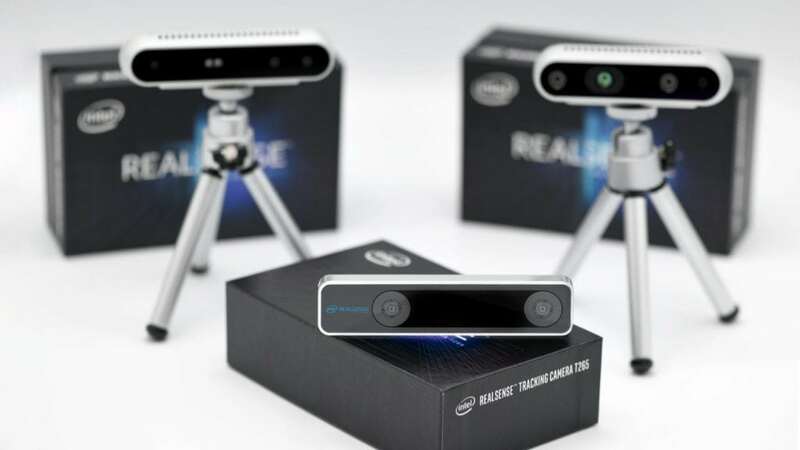 The Intel RealSense D415 depth camera uses two-megapixel imagers, while the Intel RealSense D435 depth camera’s imagers are one megapixel each. Next, let’s compare “min Z” or the distance from your depth camera to the object being captured. The Intel RealSense D435 depth camera has more depth noise (>2x) at any given range compared to the Intel RealSense D415 depth camera, and it does have a smaller minimum operation distance (~0.5x) at the same resolution which means you can get closer to the camera. For example, at 848 x 480 resolution, the Intel RealSense D415 depth camera has a min Z of about 29 centimeters, whereas the Intel RealSense D435 depth camera’s min Z is 17 centimeters. The Intel RealSense D415 depth camera provides the best performance across a variety of use cases. The Intel RealSense D435 depth camera is best for use cases that require as wide a FOV as possible. Check out this comparison chart, then go to https://www.intelrealsense.com/stereo-depth/ for more comparisons and product briefs. The D435i, as we mentioned above, is identical to the D435, but with the addition of an inertial measurement unit. The IMU allows movement of the device to be measured, synced with the depth data. This means for a handheld 3D scanning application, for example, as the user moves around an object or person, successive depth frames can be matched together with the movement of the camera for improved scan quality. The T265 also contains an IMU, but in addition, uses two fisheye cameras and our own proprietary algorithms to track its own position in space with a high degree of accuracy. The T265 is not a depth camera and does not provide depth data. It can be paired with one of the D400 series cameras for applications where you might want high accuracy tracking paired with high quality depth data. It is possible to run similar algorithms for SLAM (simultaneous localization and mapping) using the D435i – although these will necessarily run on the host device you have the D435i attached to, where the T265 algorithms run on the camera itself. For some applications, this will be sufficient tracking accuracy. If tracking accuracy is extremely important though, or the camera is expected to do large movements such as a fast rotation through many degrees, the T265 will be the best solution. Please see the respective pages for the Intel RealSense depth camera D435i and the Intel RealSense tracking camera T265 for more information. For all of the cameras above, regardless of which one you choose, since they all use the same open source Intel® RealSense™ SDK 2.0, you can easily write code that is compatible should you choose to switch to a different device at a later date – this will even include later generations of cameras and other new devices, giving you the confidence that whichever Intel RealSense Device you choose today, everything you build will still work tomorrow and for years to come.